June is almost over which is semi causing mild panic. I've only made it to the beach about 2x which is disappointing. On the other hand, I finally utilized the free magic mountain tickets we scored and got a lovely pixelated black and white image onto a green season pass. So, I have about six months to use it. After a restful morning, we got there around 5pm which alloted only three rides. X2, Dejavu, and Goliath. 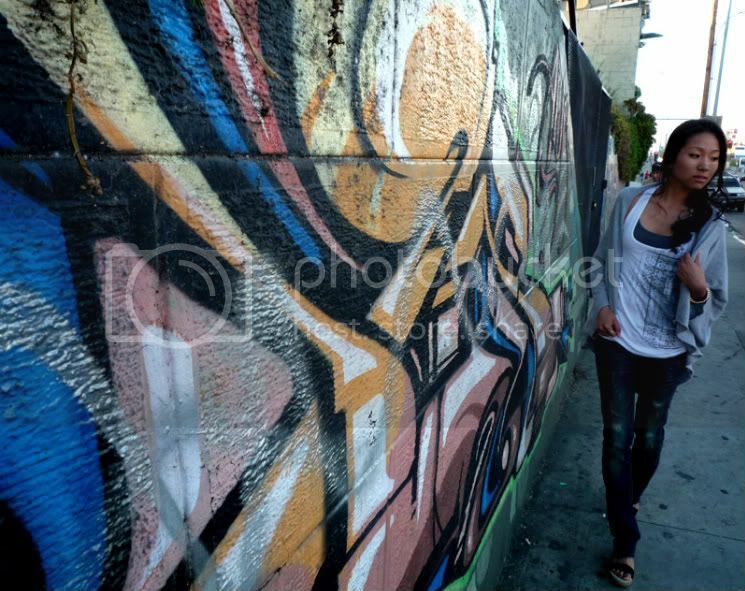 Graffitti is practically everywhere in la... some illegally.. some legally. I came to grab a burger on olympic blvd. and wanted to capture this walled art. However, when looking at the pictures afterwards, I ended noticing the gum on the sidewalk more than anything else. Hahaha. I got the tank from the LF warehouse sale... Though I was initially intrigued by the way it was designed in the back, I noticed in actually even creates a curvy look when put on. The jeans are from Anoname from nordstrom... which I got for a steal... and the sweater cardigan has been featured numerous times for its versatility. I happen to be wearing it quite often. i love all your jeans angela!